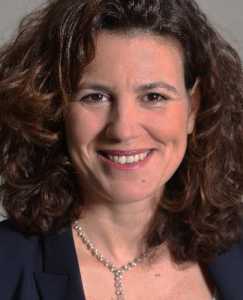 Interview with Nadia Filali, Head of Blockchain Programs at Caisse des Dépôts et Consignations: Is collaboration the key to developing a strong blockchain eco-system? Nadia Filali is director of blockchain programmes and founder of LaBChain at the French public group Caisse des Dépôts et Consignations. Here Mazars partner Jean Latorzeff and senior managers Emilie Legroux and Christophe Bonnefoy talk to Nadia about the pioneering role Caisse des Dépôts is taking in the development of blockchain technology. Why and how did the Caisse des Dépôts et Consignations (CDC) decide to get involved in blockchain? Two people brought the subject of blockchain to the attention of the CDC: Philippe Dewost, deputy director of the “investing for the future” project, responsible for the digital economy at the Caisse des Dépôts, and myself. In my case it was because of a personal anecdote. One evening over dinner a teenager said to me, “Bitcoin is great! You ought to buy, it’s going up!” I asked him “What’s Bitcoin?” and he explained. I read up on it and talked to Philippe Dewost, who co-leads LaBChain with me. He had come across Bitcoin during a conference in the United States. We investigated the subject and concluded that the technology was very interesting on an intellectual level, but that it posed a particular problem for the CDC. This is because a technology that sets out to reduce the role of trusted third parties is quite a challenge when the Caisse des dépôts has been a trusted third party for two hundred years! Then we arranged a meeting to present blockchain technology to members of the CDC executive committee. Opinions were quite divided – some people saw opportunities there, while others did not agree at all, which is a normal response to such a technology. Philippe and I carried on, and the idea of contacting other stakeholders in the market (banks, insurance institutions, start-ups, etc.) to accelerate development arose fairly naturally. It is important to collaborate because it is by nature a technology that involves interrelations with different parties and networked transactions. Then we considered the possibility of assembling a working group with various market players and with start-ups, who were receptive for the most part. In November 2015 the publication of an article entitled The trust machine in The Economist helped to speed things up, because it made the idea and the technology more credible. So at the end of November, the chief executive of the CDC agreed to the creation of a working group focusing on the digital transformation, and LaBChain was born. It is important to collaborate because it is by nature a technology that involves interrelations with different parties and networked transactions. Why was LaBChain launched by the CDC? The CDC is neither a bank, nor an insurance company; we are not in competition with the partners with whom we work. The CDC is seen as neutral and a legitimate player bringing together the stakeholders in the market. Additionally, in term of financial innovation, the CDC has always assumed a pioneering role (CO2 quotas, biodiversity, etc.). Our objective is also to encourage the emergence of a French ecosystem. That’s the primary, institutional role of the CDC, and that’s why, right from the start of the project, we got together with the banks, insurers, start-ups and developers who know the technology. The CDC brought together relevant players, this is not a consortium that is only open to banks and insurers, or focusing on a FinTech like R3; it’s a joint initiative. Does the CDC talk to R3? Yes, we have had exchanges with R3, but we are not part of R3. People often make comparisons, but R3 is primarily a company developing an IT platform for the use of banks with a commercial objective, which is very different from LaBChain. Have you only invited players from the financial sphere to take part in LaBChain? In the beginning LaBChain had 11 participants. Today there are 28 partners, bankers, insurers, mutual funds, start-ups and associations. Several industry groups have also approached LaBChain, and expansion to other sectors is under consideration. What subjects are on LaBChain’s agenda? LaBChain has a “Do Tank” and a “Think Tank” and also a training arm for partners called “Learn”. We started by training people working in banking and IT so that everyone is at the same level and using the same language. In May 2016, all the people trained in our common business areas and their support functions, including the start-ups, worked together to identify ideas. Several projects emerged. Once you have identified ideas, you need at least two financial partners to agree to launch a Proof of Concept (POC). Blockchain identification was the first subject to be addressed: how to establish the identities of customers and counterparties, and effective Know Your Customer (KYC) in accessing the blockchain. So we launched a POC on identity, which is an area in which several financial partners are working. We began by working on the specification of what we expected on this question of identity. Obviously, many questions were posed on digital identity beyond the blockchain. Then we asked all our industry partners concerned to explain to us what they thought would be their implementation schema on the basis of the technology with which they were working, whether this was a public or a consortium blockchain. Since then we have chosen an industry partner to carry out POC and the experimental work proper has begun. Finally, we started and finished a POC on the management of collateral for securities lending and borrowing transactions with four partners: CDC, Natixis, Caisse Nationale de ‘Prévoyance. (CNP) and Crédit Agricole in partnership with OCTO Technology. This POC was completed in six weeks. It was tested on an Ethereum platform and it is operational. – to test how far a consortium blockchain in these areas would also enable us to comply with the current regulatory framework. Once the initial work was completed, we decided to continue to develop this project. Research is currently in progress. We are working in partnership with the regulator, and with more partners than at the start. One of the claims Corda makes is that each business has its own needs that are not taken into account by existing infrastructure. In the POC on identity, did the Ethereum platform meet all your requirements? We are aware that the technology in this area can still be very immature. However, there are many changes and solutions emerging.. We found that Ethereum exposed the subject of managing the confidentiality of transactions. If two partners carry out lending and borrowing transactions in a consortium blockchain and the flows are visible, this is not very important. If ten partners are in a consortium and they can identify every flow, that doesn’t work. We now need to address the question of how to manage the transaction and its confidentiality by using the concepts of homomorphic encryption. That is why the CDC is also working with players in R&D to adapt these products and overcome the constraints of platforms open to everyone. – scalability (volume of use). Levels of performance will depend on whether a public or a consortium blockchain is used. In addition, there are a number of questions: is it performing in terms of volume and flows? Does it involve excessive energy consumption? Is the size of the blocks limited? In terms of dependency on the players, that comes back to governance; will establishing a blockchain make us dependent on other players, which is impossible in our chain of value today? How to work on the incentives? Blockchain has been created with a view to increasing transparency, but several questions may arise. Whether it is a public or a private blockchain, how can governance be managed in a decentralised way? How can system maintainability be managed? How should we handle all the aspects of authentication, identification, and data confidentiality? Scalability is not still sufficiently developed today. All these questions are systematically addressed in the course of a POC. Blockchain needs to develop, and all manner of skills other than code entry must be brought in. IT architects have worked with us on the project, because there are real questions of hybridisation and integration in our systems. On another note, have you identified technologies that are in competition, or competing initiatives? – initiatives in a particular field of activity. There are several forms of cooperation. But today it is important to move towards open cooperation and innovation in this field. Of course, there are competitors and competing technologies, but given the maturity of these technologies and the complexity of the questions to be tackled, closed innovation makes no sense. Do you think the regulator is open to adaptation? – the law of 28 July 2015 on autonomous energy distribution. There is increasing awareness which is capable of changing things, and the dialogue is constructive. The French regulator is inclined to open the debate. They have asked us to submit our solutions, and are very open on the subject. The Autorité des Marchés Financiers (AMF) and Autorité de Contrôle Prudentiel et de Résolution (ACPR) initiative launched in July 2016 and the FinTech forum, which I’m involved in, is one example. The aim is to develop a pragmatic approach and to stimulate debate on how to develop aspects of FinTechs, RegTechs and blockchain, while trying to meet end customers’ demands, since the primary purpose of the regulation is to protect the end customer. So I think we’re on the right track. However, it’s clear that there are places that are developing just as fast. Switzerland is continuing its work on FinTechs, as is Estonia, which is making progress in this area. There is further investment across the Atlantic and in Asia. In Asia and the United States, more than 90% of the €1.5bn of investment in blockchain companies goes to the US, whereas the European and French projects are really quite small. There is increasing awareness which is capable of changing things, and the dialogue is constructive. Regarding securities platforms, could blockchain make it possible to increase the transparency of and confidence in processes? For me, because I used to work in the securities back-office, if the promise is to transfer ownership in ten minutes that’s interesting. Blockchain could bring together front-office, middle-office, compensation and clearing in a single point. Reporting to the regulator would be automatic and it could even come to collect it. It is no coincidence that there are at least seven projects of this type under way. Japan, Australia, the NASDAQ, Deutsche Börse and Deutsche Bank are all working on it. On our side, BNP Paribas, CACEIS, the Caisse des Dépôts, Euroclear, Euronext, S2iEM and Société Générale have set up a European FinTech, with the support of Paris EUROPLACE Liquidshare. Born of a partnership launched in 2016 by its shareholders, this new independent start-up will develop a post-market blockchain infrastructure for the SME segment. This innovative young enterprise aims to optimise access to capital markets for SMEs, improving the security and transparency of post-negotiation processes thanks to blockchain technology. With the financial support of its seven shareholders, the company aims to develop and manage post-negotiation infrastructure especially designed for these undertakings. Ultimately, the solution aims to reduce transaction costs. With Europe-wide ambitions, this start-up is relying on blockchain technology. This technology has the potential to significantly simplify the chain of post-negotiation processes, guaranteeing and consolidating securities registers while enabling rapid processing with instant real-time settlement and delivery. Well indeed, some people think that blockchain can help accountants and improve the traceability of transactions and accounting entries; there has been a lot of discussion on this topic. In terms of confidence, it depends on where you stand. If you work with a consortium blockchain, you create shared programs with a permission system and the proper functioning of the project is guaranteed by the confidence that everyone has in each of the players involved. The public blockchain is a bit different, because we are unclear as to the notion of incentives, about who keeps the motor turning and under what conditions. Practices do exist and are possible, but tomorrow’s public protocol is perhaps not in existence yet. People still have too many reservations about Bitcoin or Ethereum, in particular regarding their governance, which currently prevents them from gaining further industry leverage. Jean is currently co-head of services to the Banking industry in France at Mazars including audit and advisory. Jean has been a partner since 2006 and has significant experience in the banking sector across retail banking, asset management, private banking, corporate and investment banking, specialised financial services and central banks.